It is a real treat that The John W. Engeman Theatre is currently mounting A Gentleman’s Guide To Love & Murder. The top-notch cast is remarkable leaving the audience in stitches. The hit show plays the beautiful Northport venue through April 28th, and it is sure to be a must-see this season. The two-act farce, wonderfully directed by Trey Compton, tells the tale of Monty who has learned that he is an heir in the famed D’Ysquith family. When he realizes he’s ninth in line, Monty shrugs off his findings thinking the family wouldn’t even know who he is. However, he wonders if he could make it to the top of the family tree by bumping off those who stand in his way. Don’t worry about the murders; this is an all-out comedy. Indeed collecting the most laughs is Engeman vet Danny Gardner portraying each member of the D’Ysquith family who is before him in the heritance. Mr. Gardner does a tremendous job giving each family member a very distinctive personality and his top-notch comedic delivery. Mr. Gardner makes a great team with Sean Yves Lessard who charmingly portrays Monty. Of course, the women of the cast are stellar. Katherine McLaughlin is adorable as the pious and witty Phoebe D’Ysquith. Moreover, Kate Loprestis superb as sassy Sibella. In truth, I really could go on and on about the entire company as they all extraordinary. On the talented creative team, Nate Bertone‘s set is well-done. Portraits of Mr. Gardner as each of the D’Ysquith’s hang along the outside of the stage. On the stage, it is mostly a stationary set bringing in rolling pieces for each of the locales. The wigs, perhaps, could have been more to the Engeman’s high standards, but I digress. This is enhanced masterfully by Matthew Solomon‘s relevant costumes from 1900’s London; corsets and suit tails abound. Also, it is always thrilling to see a live band this one excellently headed up by James Olmstead. They deliver the Steven Lutvak/Robert L. Freedman score splendidly. As you can probably tell, A Gentleman’s Guide To Love & Murder is another hit for Northport’s John W. Engeman Theatre. A remarkable cast and entertaining story make for an enjoyable night of theatre. Northport’s exquisite John W. Engeman Theatre does it again with a boffo incarnation of Buddy – The Buddy Holly Story. Running through March 3rd at the Long Island venue, the musical is strongly directed by Keith Andrews and boasts an absolutely stellar cast many of whom have been in previous productions of this show. While we know Buddy (along with a few of his friends) died young and tragically in a plane crash, Alan Janes has certainly created a joyous celebration of Buddy’s life. The award-winning show has had a very extensive life originating in the West End in 1989 running there until 2008. It was on Broadway from 1990 to 1991 and has toured and been done locally, regionally, and worldwide ever since. In the Engeman’s production, Michael Perrie, Jr. excellently stars as the rock and roll pioneer. You will find he is a natural in the role as he belts out some of Buddy’s biggest hits including “Peggy Sue”, “That’ll Be The Day”, and “Maybe Baby” among many others. The show is well thought out having the first act (and a little of the second act) set over several years telling the story about how Buddy started with his band, The Crickets, and the pressures of the music industry as he and the band wanted to move from country to rock-and-roll. It also shows him meeting his wife, Maria Elena portrayed adorably by Lauren Cosio, and the band recording. Then most of the second act shows their final performance at Surf Ballroom in Iowa. It is truly one big party as we also see performances by The Big Bopper, portrayed by the delightfully charismatic Jayson Elliot, and Ritchie Valens, portrayed charmingly by Diego Guevara. The whole company is truly brilliant as is the clever creative team. Jordan Janota’s set is smartly stationary with some rolling pieces that make for flawless scene changes. This is enhanced beautifully by Doug Harry‘s atmospheric lighting and Dustin Cross‘ great costume choices as we are in the late 1950s. It is also thrilling to see that the enthusiastic audience was also into the participation aspect. And so, Buddy – The Buddy Holly Story, is indeed another hit for the Engeman. I am certain that, even if you are not overly familiar with Buddy Holly‘s music, you will have a wonderful time. And his fans I am sure are elated this production honors him so beautifully. Being an old soul myself, I think it is safe to say you will be happy to have seen this must-see production this season. When I attended the Broadway incarnation of In the Heights, I thoroughly enjoyed it. Accordingly, when they announced their current season, I had the utmost confidence that the showing at the gorgeous John W. Engeman Theatre was going to be just as stellar. Being The Engeman, I was proven right. The wonderful production runs through April 29th at the Northport venue masterfully directed by Paul Stancato. The Best Musical Tony winner, conceived and scored by multiple Tony Award winner Lin-Manuel Miranda with the book by Quiara Alegria Hudes, tells the tale about the historic Washington Heights community in New York City. Explored are the people, the culture, and what it is like to live in the area. Several stories weave throughout the show that, at its heart, is about people simply trying to navigate life. Excellently leading the cast as bodega owner Usnavi – Mr. Miranda’s role from the Broadway showing – is Spiro Marcos in his Engeman début. Mr. Marcos receives roaring applause and laughs for his natural wit and first-rate renditions of “96,000” and the show’s title number with the company. Also, Mr. Marcos’ performance of “Hundreds Of Stories” with Tami Dahbura, portraying Abuela Claudia, the town grandmother, is truly endearing and an audience favorite. Also a highlight among the amazing cast (and in another Engeman début) is Cherry Torres who is terrific as Nina, a college student who has returned to the neighborhood. Nina’s passion to make sure she makes her parents proud, yet standing up for herself under the pressure, is relatable and Ms. Torres delivers admirably. Also enjoyable is Iliana Garcia – in yet another Engeman début – as salon worker Carla. Carla is a sweet and well-meaning woman, but, shall we say, a little slow and Ms. Garcia brings many laughs in addition to being a stand-out in many of the dance numbers. In truth, I could go on and on about the brilliant cast, but I’ll sum up by saying that I could possibly see several of them in the Broadway production had it run longer. On the creative team, the set, designed by Christopher Ash, is stunning and seemingly captures well the spirit of the Washington Heights community. Usnavi’s bodega, the salon, and the car service that Nina’s father owns are included as well as fire escapes above the bodega and car service. This is enhanced beautifully by John Burkland‘s lighting design and Christopher Vergara‘s costume design. Sandalio Alvarez’s choreography is also top-notch and well accompanies the score filled with hip-hop, salsa, merengue, and reggaeton which is performed by a thrilling live orchestra headed up by Music Director Alec Bart. And so, In the Heights at The John W. Engeman Theatre is incredibly entertaining with an absolutely remarkable cast. This heartfelt story and well executed show make for a thrilling night of theatre. One thing is certain: Northport’s stunning John W. Engeman Theatre never disappoints. This especially with their latest offering of the eight-time Tony winning musical Once. The absolutely exquisite incarnation, running through March 4th, is outstandingly directed by Trey Compton and boasts an incredibly gifted and beautiful cast. Based on the 2007 movie, the story centers on a woman and a man (not officially named in the show) who, besides instant attraction, are drawn to each other by music. However, it is a complicated and heart-tugging situation. Broadway vet Andrea Goss superbly portrays the woman, a young Czech mother in Dublin, Ireland. Indeed an audience favorite is her moving rendition of “The Hill” in act two. Ms. Goss and a charming Barry DeBois, who portrays the man, make a sensational team. His torment in choosing what do to – rekindling his romance with his longtime girlfriend who recently moved to New York or stay with his new found love – is well exude by Mr. DeBois. To really feel their journey, pay extra close attention to the gorgeous score by Glen Hansard and Markéta Irglová who are also the stars of the movie version. The whole cast are also musicians even serving as what would be the orchestra in addition to their speaking parts. Ms. Goss on the piano, Mr. DeBois on the guitar, and there are drums, percussion, strings… it’s thrilling to see, really. As for the set, a bar is the centerpiece. Several chairs are moved around consistently so when the cast is not “on stage”, they take a seat on the side. Also, before the show and during intermission, it is a working bar serving drinks to patrons while the cast performs. It adds immeasurably to the show when it is engaging and the audience is respectful. And above the bar section is a – if, perhaps, a little juvenile looking – hill where our leading players have a powerful conversation. The visually alluring show is strikingly enhanced by Mr. Compton’s choreography and Cory Pattak’s lighting design. And so, Once is undoubtedly a must see for this season. An extraordinarily affecting story and a remarkable cast make for a great night of theatre. The holiday offering from the exquisite John W. Engeman Theatre of Northport, Long Island, is an excellent production of the classic Tony winning musical Annie. Marking the half-way point of the Engeman’s dazzling 11th season, this production, running through December 31st, is superbly directed by Antoinette DiPietropolo who also serves as Choreographer. Now I know you’re probably thinking: Another production of Annie? Well, when you have a cast as remarkable as this, it definitely warrants another visit. The tale, based on the comic strip Little Orphan Annie, follows 11-year-old Annie as she tries to locate her parents who dropped her off at the orphanage when she was just days old. With a lot of hope – and luck – she meets a well-connected billionaire, Oliver Warbucks, to help her on her quest. Broadway’s Presley Ryan is terrific as our red headed heroine. Annie’s hopeful attitude and positivity are well executed by Ms. Ryan and receives roaring applause for her performances of the iconic “Tomorrow” and “Maybe”. Additionally, Ms. Ryan makes a great team with George Dvorsky, another Broadway vet, in the role of Mr. Warbucks. Their rendition of “I Don’t Need Anything But You” is charming and charismatic and you can sense their connection. Additional highlights of the cast include Lynn Andrews as Miss Hannigan, the horrible matron of the orphanage where Annie stays. Ms. Andrews’ rendition of “Little Girls” is delightfully creepy and the comedic spin she puts on the role is extremely entertaining. And, if I may, a special kudos to the absolutely adorable AnnaBelle Deaner portraying Molly, the youngest of the orphans, who is an absolute firecracker. There are two casts among the children and Annabelle is part of the superb Green cast. As you can probably tell, the entire company is truly top notch. On Ms. DiPietropolo’s clever creative team, the set, done by Christopher Swader and Justin Swader, is stunningly enhanced by John Burkland‘s beautiful lighting design and Kurt Alger‘s gorgeous costumes. It seems like a very busy show and being a large cast, everyone is able to pitch in to ensure seamless scene changes. And the company runs through Ms. DiPietropolo’s fun choreography with élan particularly the children with “Hard Knock Life”. The entire production is visually stunning. And, of course, it is always thrilling to see a fantastic live orchestra headed up by talented Music Director Jonathan Brenner. And so Annie is certainly another hit for the John W. Engeman Theatre of Northport, Long Island. A stellar cast and a classic show make for a fun night of theatre. To start, this article will probably not do this incredible production justice. 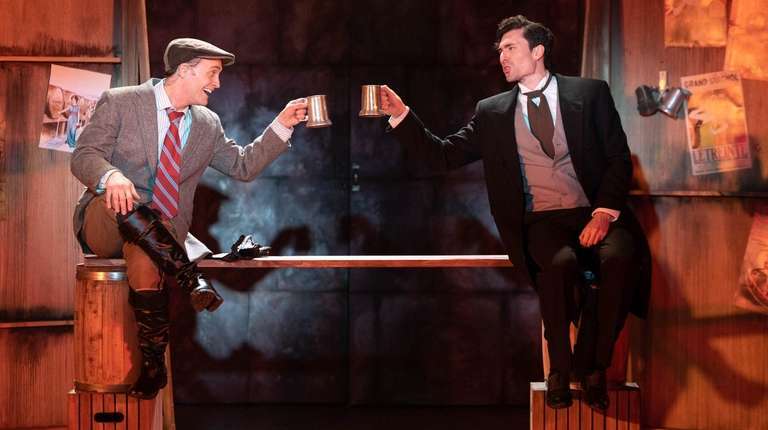 The latest at the John W. Engeman Theatre of Northport, Jekyll & Hyde, The Musical, is absolutely electrifying and the Broadway caliber cast is positively glorious. This is, without a doubt, a must see for Long Island this season. And by the reaction of the sold out audience on opening night, you may want to get your tickets quickly as this runs through April 30th. Set to a commanding pop-rock score by Frank Wildhorn (music) and book writer Leslie Bricuse (lyrics), the thriller follows Dr. Henry Jekyll attempting to cure his ailing father’s illness by separating “good” from “evil” in the human personality. Dr. Jekyll, however, inadvertently creates an alternate personality of evil – who he names Mr. Hyde – and wreaks horrifying havoc in London. Paul Stancato wonderfully directs and choreographs the brilliant cast headed up by Nathanial Hackmann. A wondrous talent and spectacular voice make Mr. Hackmann a natural in the role(s). His sharp attention to detail for each character (stance, movement, ext.) is inspired. This particularly during the intense “Confrontation” number where Jekyll is battling Hyde to be free from his murderous grasp. And, naturally, the leading ladies are dazzling. Liana Hunt portrays Emma, Dr. Jekyll’s fiancé. Emma’s sweet devotion to Dr. Jekyll balances well with her headstrong demeanor. Indeed, her rendition of “Once Upon a Dream” is met with thunderous applause. And Caitlyn Caughell is superb as Lucy, the main attraction at The Red Rat, a sleazy club. Just as Jekyll has a “light” and “dark” side, Lucy is the “dark” to Emma’s “light” as Lucy is deeply attracted to Hyde. Ms. Caughell’s performance of “Bring on the Men” was particularly fun and sassy. I really could go on and on (and on!) about the entire cast, but I think you get the idea that the entire company is really outstanding. As for Mr. Stancato’s amazing creative team, a clever set by Stephen Dobay is enhanced ideally (and, at times, chillingly) by Keith Truax’s lighting (Dr. Jekyll’s basement laboratory is a highlight). The mood and tone is set perfectly under the musical direction of Kristen Lee Rosenfeld and her orchestra with Laura Shubert‘s spot-on sound design. Additionally, Kurt Alger’s costumes are breath-taking. Even as I write this, I am still rendered speechless at this exhilarating production. A top-notch production with an unnerving story make for a thrilling night of theatre.